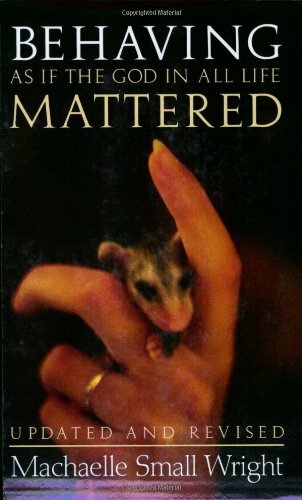 Despite the Christian-sounding title, Behaving As If the God in All Life Mattered is actually a memoir in which the author embraces nature spirituality. The author relates her life story, which includes the usual assortment of good and bad memories, not all of which have anything to do with spirituality. There is a moment of odd humor when she relates how she told her school teacher she was afraid of “Freedom,” which was the name of a big, mean horse. She was abused, and neglected to the point where she was self-supporting at thirteen. The entire first half of the book is about her hard life and struggle for survival before she blossoms as a spiritual person. The second half of the book is about the author’s spirituality based around her garden, which she names Perelandra, after a science fiction & fantasy novel. Indeed, some of the experiences she relates read like fantasy: trees falling where ordered, carrots sprouting inches out of the ground where seeds were not planted, and manifesting garden supplies from nothing. The author starts her spiritual gardening by following the instruction in a book about the garden at Findhorn. She works with nature spirits and with beings she calls “devas,” a word from the Hindu religion, although she does not mention embracing any part of non-Christian spirituality beyond the garden experience. She writes that other people experience nature spirits as fairies, gnomes, et cetera, but that they appear to her as energy because they know that is what she is more comfortable seeing. She writes about learning to work in partnership with nature. The edition I read is not the first edition. In the second half of the book, there is a “part 3” which is a continuation of part 2, in which the author talks more about nature spirituality. Although part 3 is more of part 2, it contains more interpretation and less of the immediacy of experience, so it starts to approach the level of didacticism one would expect from the title, and is not as good a read. At one point, when talking about the pond at the abandoned mansion, she denies her own lived experience and completely re-interprets what she experienced with nature spirits though the lens of monotheism, saying the nature spirits are not really individuals after all, but are part of a single larger entity. She talks more about philosophy than in the original part 2, and it is depressingly Christian-influenced, talking about Free Will and other Christian concepts. When the author relates her actual experiences, religious or otherwise, she is on firm ground and tells an exciting story that I really identify with and relate to, although for me the stunning discoveries she made about gardening at Perelandra in her first year are pretty much the things my father taught me as a small child. When she tries to explain why things are the way they are and interpret her experiences later, I find I relate less to the book because of the author’s profoundly different worldview than mine and because she is no longer telling her personal story but telling what she thinks abstract concepts mean and trying to instruct the reader. Still, I don’t think the addition of part 3 ruins the book, since there is still so much of a great story in it. Both part 2 and part 3 gave me a vocabulary for talking about nature spirituality through gardening, which I find I can use to communicate about this topic with both my fellow heathens and pagans, and with Christians. This book is mis-titled and mis-packaged. With the title that sounds as if it were a book of religious instruction for those who believe in the god who is called God, and back cover copy that screams, “A book that will forever change the way you live!” it looks like a Christian-oriented self-help book, perhaps slightly New Age in the sort of empowerment motivational poster way that makes me roll my eyes. There is only the barest hint in the title or packaging that this is an autobiography, much less that it is a memoir about surviving child abuse and growing up to be a spiritual person, like my own memoir (Greater Than the Sum of My Parts.) The packaging makes it seem as if this would be a didactic, evangelical sort of book, telling people how to live their lives, and it’s really someone’s personal story of her journey in life and on her spiritual path. I really identify with both halves of the book, both the story of surviving abuse in childhood and of how hard it is to leave it behind in adulthood, and the story of basing one’s spiritual practice around gardening. It certainly isn’t going to change my life, though. For me nature has many, many gods, so the title and back cover copy really put me off. I would never have opened this book if someone had not handed it to me saying that the way I talk about my life and my garden reminded them of what’s in this book. I’m glad I read it, and I would recommend it, but I’d recommend the two halves to two different audiences: the first half to people looking for memoirs of surviving child abuse and neglect, and the second half for readers looking for memoirs about practicing nature spirituality in the garden.